Pilot Plant testing; preparation of test bed for air turbines. Shoreline gully Oscillating Water Column; the wave chamber is integrated in a natural gully, fitted into the rocky coastline. 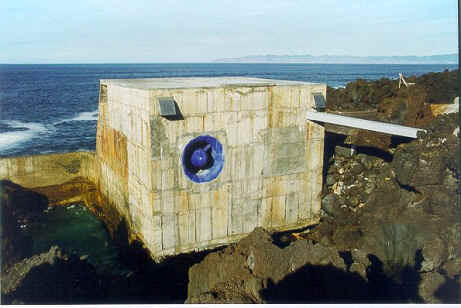 The device is located on the shore of Pico Island, Azores, near Madalena Portugal. The plant was completed in 1999 but flooding and malfunction of the Wells turbine affected the testing program of the plant, leading to long delays (Falcão, 2000). Full scale testing was only performed during a short period in October 1999. In 2003, the Wave Energy Centre (WavEC; renamed in 2013 as WavEC Offshore Renewables), a non-profit association dedicated to the development and promotion of ocean wave energy, created in Portugal, obtained national funding to proceed with the refurbishment of the plant, under a specific national funding scheme for pilot projects related to scientific innovated systems (PRIME/DEMTEC). In 2004-2006 a set of relevant repair works were undertaken under the co-ordination of WavEC, as part of a national funding scheme and a program of monitoring tests accompanied the commissioning of the plant. The basic function of the plant was reconstituted in autumn 2005. Substantial limitations of the operation persisted, mainly due to the inappropriate design of the turbine support structure, inherited from the original project. The automatic operational modus was insufficient due to the original plant layout and equipment. Since 2005, three minor accidents (affecting guide vanes, bearing, and glassfibre of the air tunnel) and insufficient funding prevented the project from a faster and complete recovery. Progress has been made and the plant started to be capable of operating at rated power autonomously since 2008. EDP provided the investment to refurbish the functional and visual aspects of the Pico OWC. In 2012 the plant started working with autonomous operation. During 2013 electrical problems were diagnosed and several repair works have been done. The plant was facing structural deficiencies and several initiatives had been taken by WavEC in collaboration with the Azores Regional Government in order to recover the structure and promote the plant within the region. Considering that the plant had already fulfilled its objectives as a pilot demonstration project, and in view of the wear and tear on the submerged part of the structure, in February 2016 WavEC’s Board of Directors communicated its decision to close the plant, requesting the requirements to ensure safe and environmental conditions. In January 2017, due to the interest shown by the Regional Government in a viability analysis of the recovery of the plant, WavEC suspended its decision to close. However, as it was not possible to conclude its feasibility, the project to dismantle the plant went ahead, being prepared by EDA and EDP ( the two Portuguese utilities). After the partial collapse of the plant on April 17 2018, all the necessary measures were taken to contain potential risks, the plant was disconnected from the network and security measures were taken. The Pico Plant has made a very valuable contribution to the promotion of wave energy research, development and innovation, both at a national and international level. During its lifetime it attracted funding from more than 11 national and European projects. The Pico Plant was part of two European networks of test infrastructure for wave energy technologies (MARINET AND MARINET2), promoting the access of international teams to the plant. The plant originated more than 100 international scientific articles and was associated with more than 8 doctoral theses and numerous master's theses and scientific internships. At that time, the licensing of the device and its evaluation with respect to environmental issues was new to the authorities. As EDA (Electricidade dos Açores) was a project partner, some facility in obtaining the required permission can be assumed. However, the regional authorities showed their serious concern regarding the environmentally acceptability of the plant, which proved very difficult to overcome, however no specific studies have been developed for baseline and impacts characterization. To date, and mainly due to the short operational periods of the plant, there are no systematic monitoring regarding environmental issues however an acoustic monitoring survey has been carried out to characterize both airborne and underwater noise levels. Pico Oscillating Water Column is located in Portugal. Airborne and underwater noise levels. Underwater sound propagation. Underwater sound characterization of the OWC Pico Plant: consisted in the placement, roughly 10 meters offshore the front wall of the plant, of a tripod on which an auto-recording hydrophone had been previously fixed. The Underwater noise propagation data was recovered from a boat through a hydrophone hanged in the water via a semi-closed surface marker buoy. The measurements consisted in noise propagation data in function of the distance moving away from the plant. Three transects, corresponding to three different directions in comparison to the plant, were performed until a maximum distance of 3km. The airborne noise measurements were almost impossible to carry out from the boat due to the meteorological conditions. Thus they were collected on land. Underwater sound characterization: recorded acoustic data of approximately 5h30min over 22 hours. Through the data analysis the already expectable existence of an increase of noise when the plant was operating was identified. Another interesting finding was the “visibly” good correlation between the operating data when the plant was running and the data recorded. There were two main phenomena visible: the existence of harmonics related with the rotational speed of the turbine, and the existence of some spreading in a frequency range related with the pressure in the air chamber. Underwater noise propagation: It was not possible to identify the noise levels of the plant in operation from all transects’ measurements. The underwater noise characterization and the sound propagation of the wave energy device have been analyzed under the national funded WEAM project.